When the Nine of Pentacles appears in your Reading, you can relax, sit-back and exhale for the pressure is off you now. You have, or are on the brink of realising your goals. Your crops have matured nicely and are ripe for the picking. Your harvest is bound to be plentiful and you will have just cause to celebrate. It has all come together marvellously, maybe even better than expected. To say that you have made a success is an understatement, but both you and I know that it was hard-earned. By the way, you have done this almost single-handedly too, with very little input from others. This card can suggest that you have made many sacrifices or denied yourself freedom and spontaneity in order to achieve your goal or dream. You are not afraid of hard work even though you may miss out on fun in your life. This is all your work and you can take the credit for all your success too. A round of applause is needed. If you have made any investments then it augurs well for they have matured nicely and the return will be more than you expect. This is a card for a mature, independent and successful business person who has spent his or her whole life working towards their goal. It speaks of self-reliance, self-discipline, self-belief and self-control. Patience and tenacity have been your constant companions along with an unwavering focus and gritty determination. Your self-control has curbed any impulsive moves or knee jerk reactions which may have stymied your success. You have managed to handle all the ups and downs by falling back on your own resources, learning from direct experience and also from your mistakes. You are a professional down to your toes and also quite a tough cookie. Nothing really phases you anymore as everything you do now has been personally tried and tested. The Nine of Pentacles brings wonderful associations of material wealth, strong financial security, luxury, abundance and good health. Prosperity is yours in many, many ways. Your hard work has paid off and you are now in a very comfortable position, especially financially. The Nine brings you to the end of a cycle and for you it has been a journey of consistent and sustained effort. It tells of long-term goals, made at a time when you might possibly have been much younger. You may never thought you would see this day, but deep down there was always a steady confidence and self-belief. You have proved to those around you that if you want something very badly; a dream, a goal, to succeed then you can do it once you are prepared to put in the hard work and don’t expect overnight success. The Nine of Pentacles suggests that you have made a success of your life and are now in possession of the secret ingredients of that success. By learning through experience you have unlocked the door to that magical formula and can apply it to anything you get involved in from here on in. Success breeds success and don’t you know it. With this Nine, everything in your life is flourishing and thriving especially in business and finance. Success has opened doors that would generally have remained closed to you up until now. Your name and reputation may be known in high places as you now have gained reputation and status. You may be much in demand as a result and may find it unnecessary to put you hand in your pocket on occasions. Your name and face might be worth a lot of money to others. Restaurants may prefer your patronage rather than your money as your high status presence encourages a similar clientele. Designers may ask you to endorse their clothes by offering them to you free of charge. Bank Mangers may be falling over each other to get your custom. You are a big success story and should feel very proud of your achievements. When the Nine of Pentacles appears you no longer have to work so hard or put in so many hours. You do not have anything to prove anymore. Any work and effort done to date is thriving and flourishing and does not need as much one to one focussed attention. Things are taking care of themselves nicely without you having to worry, for you have put all the necessary aspects in place and they are secure. You now have time to turn your attention to yourself or to other interests. The Nine of Pentacles indicates a time of concentrating on the self and indulging it. You may be rewarding yourself for all your hard work by buying expensive clothes or accessories. That Prada bag, those Jimmy Choo shoes. Well, why not? You would never have been able to justify them years ago when you were younger but can probably well afford them now and consider yourself worth it. You are successful within your own rights so you may as well show it externally too. Looking after yourself is key and trips to the Health Spa and investing in regular massages and manicures are all part of the Nine of Pentacles time. Pamper time all round. The Nine of Pentacles may suggest that you are approaching middle-age or older and no longer see the need to rush around, wearing yourself out and being at everyone’s beck and call 24/7. Your children may be raised and the college fees paid. You can now move at a slower, more gentle pace. You are beginning to feel a peace in your life now and have the time to appreciate all that you worked so hard for. You might be enjoying your home for the first time and relish having the time to smell the roses. Your garden may bring you great joy and you desire to spend as much time in it as possible. This may be one of the hobbies you always had to put on the long finger when you were working so hard. You might become a keen gardener or grow rare specimens of plants or flowers. The Nine can sometimes suggest a move to the countryside. You may decide to relocate from the busy city to the beauty and less hectic pace of the countryside. You have a strong attachment to the natural world and this is something you have wanted to do for a long time. You might be searching for the ideal property or site to build on. Then again, you may be on the look out for a rural holiday home now that finances are strong. You may be viewing it as another investment or as an idyllic place to rest and relax. This Nine can also imply that you are keen to find an old property to restore and would not look on this as work but rather an opportunity to indulge your natural eye for design and style. 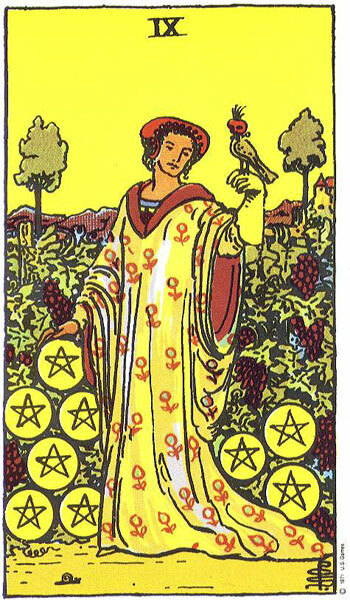 The Nine of Pentacles brings refinement, grace, elegance and sophistication. You have a natural love of the finer things in life and the arts. You also like good food and vintage wine and quality is very important to you. Therefore you may be surrounding yourself with the beautiful things in life and getting immense pleasure out of all your possessions. The Nine of Pentacles can indicate strong security around your possessions, money, assets and property. You have worked hard to accumulate so much and now it must be protected from opportunists. Try not to become too paranoid or you might see thieves and robbers in all. Speaking of possessions, you must guard against becoming too attached to them. There may be a tendency to cut yourself off from normal life in favour of your things. Let’s face it, you do like your own company and might prefer to sit in your lovely home, sipping your good wine in front of the fire instead of getting out to meet friends. When the Nine of Pentacles appears, The Hermit may be having too much of an influence on you. You might be spending too much time on your own and could retreat even further into the homestead if you allow yourself. Getting the balance right is important for it is a good thing to be independent, self-reliant and secure without constantly needing the company of others. Trips and vacations to the countryside or places of beauty are strongly favoured by the Nine of Pentacles. When it comes to Relationships, this card can represent pregnancy if found beside The Empress in a spread or an imminent birth. Check for other pregnancy and celebration cards such as the Ace of Cups, Ace of Wands, Three of Cups and any of the Pages. A mature and independent woman may have come into your life. She will be refined, graceful and sophisticated. She will not be so ready and willing to fall in love or let you into her life. However, if you are both on the same wavelength then it could augur well for a practical, comfortable, successful and very financially sound relationship. You may not have the fireworks in your love life that the other Suits have but you wouldn’t want it any other way. Finances dominate this relationship and partners may have been chosen for their suitability. Every successful business man needs a good woman behind him and every successful business woman need a good man behind her too. If the building of a business or career is strongly indicated for one partner in the relationship, then the other partner will need to be in full support of this and accept the sacrifices that will have to be made as a couple. You may not see your partner very often during the hard work years. Your relationship will need to be very strong and commitment to each other and the goal a guarantee. This is equally applicable if both partners are career ambitious. The Nine of Pentacles can suggest retirement or vacation. The effort and hard work put into your relationship over the years has paid off. You can now enjoy your retirement together with deep respect and regard for each other instead of dreading the constant company of each other. Both of you enjoy the good things in life and all the trappings that money can buy. You can now catch up on all those times when your denied yourself treats and luxury. Time to book your retirement holiday; perhaps a luxury cruise or the Orient Express. Make sure to book only the best of hotels and restaurants. Why not travel first class too? You deserve it. The Nine of Pentacles is a strong card for success in relationships but it may not be everybody’s cup of tea or idea of a perfect relationship. It is a relationship based on equally ambitious partners who are very self-disciplined and have strong priorities. They may have made many sacrifices over the years to get where they are today but they are more than happy to have done it. Obviously this is a very positive card when it comes to Career or Business. It is a Card for a very strong and professional Business Person or Business. You have worked extremely hard to get to this stage and more than likely started with very little. You can sit back now and look at what it has grown into. At long last all the effort you have put into building up your business has paid off and you can enjoy all the financial rewards. Your crops have been harvested and much money has been made as a result of your sustained efforts. Your business is thriving because it was built on solid foundations. Like the Pentacles growing all over the wall in this Card your business may have grown and spread or new businesses may have sprouted from the original one. This Card may suggest retirement or that you no longer have to work as hard as you did in the past. It is a time to enjoy the fruits of your labour. You may be ready to step back from your business and let your children take over. Your business will be in good hands for you have taken care of every last detail. You should be very proud of yourself and take a well-earned break. However, being a Pentacles Card it is unlikely that retirement years will be spent sitting around the garden all day long. It is highly likely you have a hobby or two and are eager to spend more time developing them. Because you now have the midas touch, it is quite probable you will find yourself back in a business once more without consciously seeking to. If so, it will be a relaxed business which operates around you, your life and the time you have to give it and not the other way round. It really is very hard for you to do absolutely nothing after all. Do make sure to get some rest for you no longer have to slave away. The Nine of Pentacles is a really wonderful Card to appear in a Reading and brings great reassurance. When the Nine of Pentacles Reverses it can suggest that you are living beyond your means. You may be better at spending money than earning it. This is a warning for you to pull back and address your problems as you probably have built up substantial debts at this stage and maxed several credit cards. You are being irresponsible with your money and living recklessly, throwing it around and for what? To impress people? It’s a case of ordering a bottle of expensive champagne when a simple bottle of wine would have sufficed, buying more designers clothes that you don’t need and driving a flashy car that costs a fortune. Where do you think all the money is going to come from? Then again you may live your life with the attitude of ‘let’s eat, drink and be merry for tomorrow we die’. There is also a chance that it’s not your money you’re spending. You may be funded by your parents or have been left an inheritance and think that money grows on trees. Regardless, you need to exert some discipline as the well will run dry at some stage. Where taste and style is concerned, there is a tendency to follow every trend whether it suits or not. Clothes may be expensive but gaudy and tacky. Like a lotto winner gone overboard and mad, bling may be the order of the day as you like others to see how much money you have to throw around. Unfortunately, you may end up looking a bit trashy so remember ‘less is more’ and you will not go wrong. The thing is that money cannot buy sophistication, refinement or grace if you just don’t have it, and a wardrobe load of designer clothes and heaps of sparkling jewellery won’t cover it up either. You can work on it though by taming down the volume and being more discreet. Then again, you may have all the style, grace and sophistication but carry an air of superiority and look down your nose at others. You may be full of ‘airs and graces’ , conceited and way too self-absorbed with your own importance and image. Like many so-called celebrities, you may be famous just for being famous. The Nine of Pentacles can also point to the opposite and suggest you are working too hard, allowing precious little time for leisure, social activities or relaxation. It can imply that you are a workaholic. You may not need the money but continue to let work dominate your life. There can be an inability to relax even though you have earned it. It can be all work and no play. On the other hand, you may have no choice in the matter. You may have to work every hour possible just to cover your overheads and pay the bills. This is especially true if you are trying to pay for a lifestyle you can’t really afford. Unlike the first instance where you may be guilty of spending money you don’t have, in this case, you are spending everything you have earned and must keep earning more and more just to keep up. You may have set your sights high, gone for the big house, flashy car, expensive holidays and designer clothes. You might also be putting your kids through private schools or funding college. Status and prestige may be more important to you than free time or relaxation, so if keeping up appearances is important to you, then you will be happy to grind yourself into the ground. If this is your personal choice, so be it, but you may also be under pressure from your partner or spouse to maintain a certain standard of living. You will need to reflect on why you do it and what your priorities are. If someone gave you an option to walk away and live a more simple, less showy life, would you jump at it? Following on from the above associations for the Nine of Pentacles Reversed, we also see the all too common dilemmas so many well-meaning and good intentioned people have found themselves in as a result of the recession. A huge number of people made a lot of money during the boom years. They studied hard, graduated and began top salary careers with large bonuses, perks and company cars. They began relationships with similar career-oriented ambitious partners. The money poured in and the spending was frenzied. Banks were literally throwing money at them and pre-approving large mortgages before they had even been asked for. Big properties were bought and sometimes a holiday home. Then there was the pressure from peers and banks to buy more investment properties for rental purposes. When the crash came, jobs disappeared overnight along with the perks and bonuses. If they were lucky, they had a company car that was just taken back but most had probably invested in a top of the range model and were still liable for the huge monthly repayments. Property prices plummeted and spiralled into negative equity but their mortgage repayments went up due to interest rate increases. So, they were left in their big luxury houses, with the fancy car or jeep outside and wardrobes full of designer clothes. They also had the mortgages on their rental properties which were now all vacant because of job losses. The holiday home was mortgaged up to the hilt aswell. There was one big problem though, there was no money to pay for any of it anymore. They couldn’t sell because of negative equity and they couldn’t pay their mortgages because of no money. They couldn’t get a job to save their life. What a mess. So the Nine of Pentacles Reversed very appropriately highlights these wretched situations. It hit a certain sector of the population dramatically. The nouveau riche very quickly became the nouveau poor. Was it a crime for them to want to improve their standard of living or did they get their just rewards because of greed. Many worked very hard to afford their lifestyles, putting in years of study and training but others appeared to move too fast, too soon and became rich overnight. The Nine of Pentacles Reversed can also suggest that you have been very ambitious and have worked your way up the ladder in your career or business. Your goal was success and financial freedom and you have given years of your life to the pursuit of it making many personal sacrifices along the way. You have succeeded in your mission, reached your goal and realised your dream. The money is now there and plenty of it but you have lost touch with life somewhere along the way and have disconnected. Appearing more machine-like than human, your personality may be non-existent. You may only be able to converse in facts, figures and profit. Everything is weighed and measured. You know the price of everything but the value of nothing. You have what you worked so hard to achieve, but now that it is here, you don’t know exactly what to do with it. It is the accumulation of money that excites and interests you but not the spending of it. You may buy expensive properties and drives top of the range cars but they bring you no joy and you spend very little time in them. Your holiday home on the mediterranean may lie vacant each year because you do not get the whole thing about vacations and the need for them. What a waste. On the other hand, you may now be viewing your great wealth as a curse rather than a blessing. The garden walls that acted as security in the Upright Nine may now seem like a prison as your very wealth and success have robbed you of freedom of movement and social associations. You might become paranoid about security and theft. 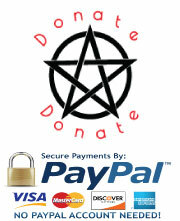 The Nine of Pentacles Reversed can bring dishonesty where money is concerned. Deceit, cons, scams and swindling may be high on the list. Look out for the King of Cups Reversed and the Reversed Magician as there may be professional criminals working their way into your company. They may be hard to recognise by appearances as they are well organised and hide behind suits and sharp white collars. These are the kind who want everything that money can buy but do not want to work for it. They will be after big sums of money, massive fraud or theft of luxury or collectors items. You must guard your assets and possessions well for someone may be out to take them from you. This Card also refers to property and land. If you are in the process of making a purchase, make sure you check things thoroughly, go over all documentation and fine print. Carry out all the necessary searches and surveys regardless of how genuine and sincere the sellers may be as something may not be right, or is being concealed from you. Remember, the Snail in the imagery of this Card and how he seemed out-of-place in the beautifully manicured garden. There may be something out-of-place with your purchase too. Regarding property there is also the threat of damage as a result of vandalism or storm. The discipline that was so strong in the Upright may be sadly lacking when the Nine of Pentacles falls into Reverse. You may not have the tenacity, determination or staying power to follow your plans or goals through to completion. You may be too impatient to see results and as a result become impulsive and take ill-advised action. You may fail to get the result you had hoped for. Success may be achieved but not to the level of your satisfaction. You may pull out of college too soon or fail to get further qualifications that will seal your future. There is a danger of abandoning your long-term plan in favour of a get rich quick scheme that is bound to fail. Nothing can replace good old hard work and slow but steady progress but you do not have the patience for that. Your wealth may have been gained by underhand or illegal means as we now see the wealthy drug barons living it up on the Mediterranean secure behind their high walls and armed guards. What price have you paid to get where you are today? The truth may be hidden behind all the designer clothes, fancy cars and sprawling house. Prostitution can sometimes be suggested by this Nine especially if accompanied by The Devil Card and King of Cups Reversed. If you have made financial investments for your future, you may cash them in too soon or they fail to mature as well as you had hoped for when the Nine of Pentacles Reverses. You may have to sacrifice some of your plans for retirement or may not be able to retire as planned. The recession may have had a very negative impact on your investments, and depending on surrounding Cards, you may not be able to retire at all. If you have reached a certain age, you may feel very disappointed at how things have worked out for you. You might be comparing your life to those around you of a similar age. You may see others as having an easy life or being well taken care of in their middle years while you are still struggling. Everyone seems to have it better than you. You had probably presumed when younger, a certain lifestyle you would have when older. Yes, you would have to accept that you were getting older, ageing even, but there would be a lot of positives that would go with it. You would be able to relax more, take it easy, do your own thing. You may have envisaged travel or lunching with friends. Possibly taking up golf or art classes and getting your hair blow dried every week. You would have swapped your trendy clothes for well-cut tailored key pieces that flattered and hung well. You probably planned on tinkering around in your garden or having the house revamped. What a let down and how wrong you could have been. Instead you are stuck in your boring job, eking out a mere existence, and having nothing to look forward to. You can’t afford to get you hair cut or buy nice clothes and you don’t know the last time you were able to sit in your garden. You wouldn’t be able to buy a golf ball let alone pay for a round, and holidays are a thing of the past. Your mortgage should have been paid off years ago but then there was the divorce and having to buy a new property after the money was split. You will have to work into your seventies to pay it off and you feel old, dull and dreary already. At your age, you shouldn’t have all these things to be worrying about and you feel hard done by. Then again, your health may not be great when the Nine of Pentacles Reverses. You may not be looking after your body the way you should. Nutrition may be poor and you might be lacking in physical exercise. You may be too lazy but then again, may not have the time to give it your proper attention. As this Card can suggest Menopause, there may be hormonal imbalances causing you to feel pretty low or ill. Look for the High Priestess Reversed and The Reversed Moon for more evidence of this. You may be trying to keep up the hectic pace you always did, but now must try to slow down a little. 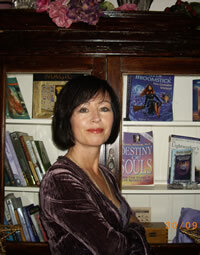 If The Empress Reversed appears in the Reading close to the Nine of Pentacles Reversed, it can suggest unnatural growths, so women should ensure they keep appointments for breast checks and smear tests. Where Relationships are concerned, you may be chasing a certain lifestyle and seek prosperous partners in order to access the wealth you desire. You want all the trappings of being rich but are not willing to put in the hard work to earn it yourself. You want to be looked after by a partner who is prepared to spoil and pamper you. You or your partner may be high maintenance and are costing a fortune. Partners are chosen for their bank balance and property portfolio. You may choose to marry for money and not love. As a couple, you may be financially sound but lack closeness and intimacy. You may marry for status or connections. There is a good chance that this is very acceptable to both of you. This is a throw back to the days of arranged marriages and especially where important families or royalty were concerned. Dowries, titles and land changed hands when the marriage was consummated. Then again you may be working so hard and career focussed, you do not have any time for relationships. However, this may be a deliberate attempt by you to avoid intimacy. You may need to take a close look at yourself in order to understand why. All may not be well in a relationship when the Nine of Pentacles Reverses. Again, you must look to surrounding Cards. Appearances can be deceiving. Outwardly, people may see you as a couple who have everything going for them and want for nothing. On the inside there may be boredom or disinterest that is masked by material trappings. You may have too much time on your hands or feel trapped by your environment as you discover that money cannot buy you happiness. Someone may be more interested in your money than you. Romance may move too soon with marriage proposals popping up before you know it. This Card is strongly linked to women and especially women of a certain age. However, it can also represent a mature man of a certain age. When this Card Reverses and you are financially wealthy, you must be on your guard against fortune hunters and seducers who will tell you anything you want to hear until they get a ring on your finger. If it all looks too good to be true; a young man or woman declaring undying love and you are old enough to be his or her grandmother or grandfather, then it probably is. Look out for the Reversed Knight of Cups for he is an expert at seduction. Where pregnancy is concerned, the Nine of Pentacles Reversed can suggest a termination or miscarriage. Then again, if you or someone you know is close to full term it can represent the actual birth, as in not been pregnant anymore. However, you may have either left it too late to have children or chose a career over starting a family. Where Work is concerned, you may be a workaholic and just do not know when to quit. You may have reached the top of the career ladder but are still not satisfied. 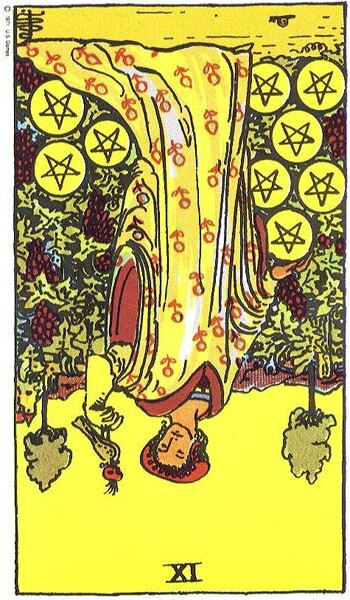 Money is all that matters and we see the Pentacles dominate the top of the Card when it Reverses compared to the Upright, where the Pentacles are nearer the ground while the woman looks away. This symbolises her interest in things other than the material world. You may have no outside interests or hobbies. Work is all there is and you have lost balance in your life. Then again, you may be very ambitious but work shy. You may seek a short cut or easy access route to the top by making a play for the boss’s son or daughter. You may even go after the boss if you think you are in with a chance. Career-wise, things may not have gone according to plan. You may have lost your high salaried job and are finding it difficult to adjust your lifestyle accordingly. Then again, you may not have put in the effort that was required and now find yourself falling behind and unable to keep up. Success eludes you at every hands turn and you may feel like a total failure when you compare yourself to others. You may have lost sight of your goals or long-term plans, or possibly got distracted. You lacked self-control and self-discipline when it mattered the most. You may find it impossible to get further in your career. Then again, you may have achieved your goal or dream career and find it not what you expected it to be. You may resent the amount of time you have to give to work which takes you away from the things you really want to do. You may walk away from a highly paid job in favour of something less demanding. The Nine of Pentacles Reversed can also suggest anti-social working hours or working 24/7. Your Business has not developed the way you wanted it to and years later still find yourself working all the hours god gave in order to keep it in the black. It may be bleeding you dry on many levels but not giving you the lifestyle you had hoped for. You may have invested all your money and have little to show for it. You may have poorly planned for your business or took short cuts which have backfired on you. There may be big losses. Your business may have a ‘flash in the pan’ success but can not sustain it in the long run. However, your business may just be slow to take off, and given time, will be a success as long as you put the effort in and remain patient. Slow but steady progress may be all you can hope for at present. When the Nine of Pentacles Reverses, your business may be very successful but gain comes from illegal dealings and unprofessional practices. You may be making money out of the misery and suffering of others. Tax evasion, fraud and embezzlement are all associated with this Nine when it Reverses. If in business, it is important to do some spot checks in all departments to ensure everything is in order and everyone can be trusted. There may be some underhand business going on or dishonesty, so check accounts and stock inventory. The Nine of Pentacles Reversed can indicate not being able to retire when you want or deciding to work on past retirement age. You may be feeling your age and find work a struggle.